Before we get into the M-Audio Fast Track Pro USB Audio Interface review, grab a snack, sit back and relax because.. The M-Audio Fast Track Pro was the first interface that I purchased back in 2007 (See it pictured here). At that time I didn’t really understand anything about home studio equipment, but I knew that I needed it for something important. Lol. I had asked my former Electronic Music teacher in college what I would need to start recording guitars and he pointed me in the direction of the Fast Track Pro. What does an audio interface do? I never bothered to ask him the logistics behind it’s function, how it sends and receives information, etc. All I knew is that I wanted to record music as easy as possible. After seemingly forever getting it set up, I wasn’t too impressed. Back then, using it with Ableton Live Lite was a huge headache, but of course keep in mind I was a relative noob. Still, I would suggest experimenting with the free Audacity if you’re a beginner. You could also opt for something like Reaper, where you can try it before you buy it. Both are very user friendly and work great. The main problem I had with the FTP is that I had to turn the gain all the way up to even hear anything. This is a common complaint among reviewers, and I remember someone asking me once if I had turned the phantom power switch on before I started recording. I truly would hope so, lol. Honestly though you wouldn’t hear any sound at all with it not turned on, so we can disregard that. I remember recording a few raps and having to literally yell the lyrics into the mic with the gain turned all the way up. That to me is a major internal flaw. The fact that I could hear myself clearly but the sound was very low suggests that the phantom power was turned on, but the preamps were poor. Another common complaint from people online. All in all, the interface functioned adequately otherwise. I ended up selling it a couple of years ago and eventually purchased the Focusrite Scarlett 2i2. It’s a great interface, but keep in mind that they have not updated the drivers since I bought it (12/2014). Because I haven’t really updated my PC, it still works perfectly. But for new users with newer equipment, you may run into issues. For newer PC’s I would suggest the second generation Scarlett 2i2. More on that at the end! Easy to use with Garage Band. The sound, despite being too quiet, did come out clear. Good for recording MIDI instruments. What is MIDI? Latency issues. What is Latency? Gain must be turned all the way up to get a halfway decent audio level. The built in preamps aren’t very good. Recording directly from Electric guitars. This mic provides phantom power to your microphone. Without this, the audio signal would be nearly non-existent. It takes the weak signal and amplifies it to line level. Make sure all WIFI enabled devices are disabled. I read that this could cause issues with the unit. You must disable all other devices that might interfere with the Fast Track Pro. The good news is that the drivers were updated January 16th, 2016. They had not been updated previously since 2013. I’m actually kind of shocked and impressed that they even bothered because in my estimation, this unit has kind of faded into obscurity over the last few years. Keep in mind that it will be the last update per their website. This new update is compatible with Windows 7, 8, and 8.1. It is not compatible with Windows 10. The last and final Mac update came on December 16th, 2014. Compatible with: Mac OS X 10.8.5, 10.9.5, 10.10, 10.10.1. Not compatible with: OS X 10.11 El Capitan (or later). This unit does better with a Cloud lifter or separate mic preamp to improve the sound. Preamp vs. Interface. By default the FTP will record in stereo. Just make sure you split the signal into mono (left & right), or your sound will only come out of one side. Press the Audio Track button. Then scroll down and click Split Stereo to Mono. I pressed record but didn’t actually record anything because I’m not in my studio at the moment. The idea is the same though. Better options out there for the money. I would not recommend this unit anymore. If you’re looking for the best budget interface, or just a phenomenal option, both the Steinberg UR22 and Focusrite Scarlett 2i2 are great if you’re just starting out. The Audient id14 is also amazing, but it will run you a little more. My recommendation today would be the 2i2, but like I said previously, if you have a brand new computer or something with Windows 8, 8.1, or 10, you may run into issues. So, my recommendation today is the Audient id14. It’s the perfect solution for pretty much everyone. Interested in learning more? Check out my comparison of the id14 and id22! Still interested in the 2i2? CLICK HERE FOR MY FOCUSRITE SCARLETT 2i2 REVIEW!! SEE THE SECOND GENERATION VERSION FOR YOURSELF!! Well that’s about it for today my friend! 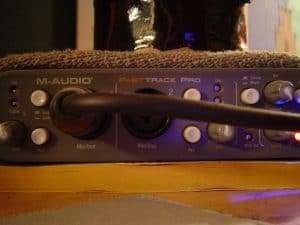 I hope you’ve enjoyed this article on the M Audio Fast Track Pro USB Audio Interface. What do you think of the Fast Track Pro? What about the others? I would love to hear from you. Until next time..